read 40 books toward her goal of 50 books. In 2011 I read 34 books--you can see them all here. When you consider how many books some of the most avid readers on Goodreads are devouring--a book a day, some even more--I wanted to challenge myself in 2012. I figured I could easily do 1 book per week, but to be on the safe side, I'd build in 2 bye weeks for myself. 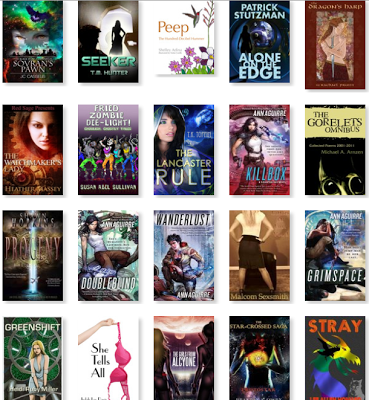 So I set my Goodreads Reading Challenge goal to 50. I found that...I am a slow reader. I did make it to 40 before year's end, besting 2011 by 6 books, so I consider this a win. Some may call it cheating that I included books I either wrote or for which I contributed a story, but I don't, and since this is my list, that's the only opinion that matters. Science Fiction Romance topped my list this year as I also took on the 2012 SFR Reading Challenge--didn't quite meet that one either, but ended up somewhere between the earth and the moon. Though I fell short of my goal, I had a good time along the way escaping reality among thousands of pages. I always consider it an honor to spend time in an author's world because there is so much work and thought and heart that goes into each book that most of us, even other writers, will never see. Which authors shared their world with you this past year? Good list... but something weird... I usually read 50 - 70 books a year, and I've never read one of these books... even though I read a ton of sci fi! Strange, huh? Of course I've read portions of HAZARD YET FORWARD, but not a single book cover-to-cover. Surreal, actually. This year, I only managed forty-some. The best two books were DELIVERANCE by James Dickey, a classic that had somehow evaded me until now, and a new book, WESTLAKE SOUL by Rio Yeours. Amazing. I wonder if you tend to read larger publishers, thus the lack of overlap between our lists? 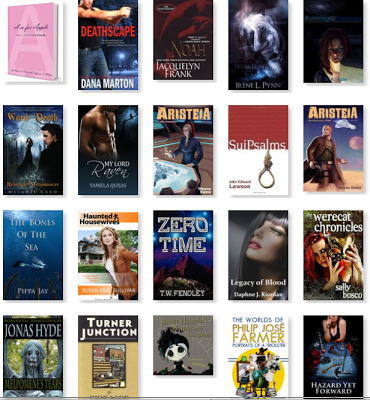 In the past two years, I've been reading smaller press and self-published works available on my Kindle. By the way, congratulations on your book deal! I haven't been back on Facebook in some time, but Jason told me about your exciting news. I'll congratulate you in person next week at residency. Ah, then, perhaps we'll see you in June. Nice list and the only one we have in common is Arnzen's. I read 149 (will probably be 150 after today). The best was--hands down--WESTLAKE SOUL by Rio Youers, which is one of the best novels I have ever read. It's a very special book. 149?! I can't breathe right now, Chris. You and Bill have convinced Jason and me to buy WESTLAKE SOUL. I'm off to visit your list now. Chris encouraged me to read it in the first place. So glad he did. Best book of the year. Good list, and you know what? I'm also a slow reader. I hit 41 this year, my goal being 40. I'm putting together a summary for my blog this morning and should have it posted soon at http://tumblr.davidlday.com/. WESTLAKE SOUL is definitely a good book. Chris and Bill convinced me it was worth the time, and they were spot on. It's interesting that you read three children's books. I have one on my list as well, THE OTHER PLACE by Nancy Robison. I came across it while picking through books at my mom's house, and remembered reading it as a kid. After rereading it, I'm pretty sure it was an early contributor to my love of SF/F/H. What lead you to the children's books you read last year? Thank you for sharing your link, David! Not bad at all. You had a much more realistic goal than I had, lol! But you also got more read, Abigail!